Honey and bananas taste wonderful together. Serve these sweet pancakes with virtually fat free fromage frais and a dusting of icing sugar for an irresistible low-fat dessert. You will find the dried bananas in the fruit and vegetable section. For the pancake topping, place the rum in a small saucepan and heat gently, then remove from the heat and stir in the bananas. Leave to stand for 20 minutes, or until the bananas have absorbed the rum. Meanwhile, to make the pancake batter, sift the flour, salt and cinnamon into a bowl and make a well in the centre. Whisk in the egg and gradually beat in the milk, drawing in the flour from the sides to make a smooth batter. Use kitchen paper dipped in oil to lightly oil a 20cm heavy-based non-stick frying pan. Add just enough batter to thinly coat the pan's base and cook over a moderate heat for about 1 minute, or until golden brown. Turn over and cook the other side until golden brown. Transfer to a warm plate and cover with a square of greaseproof paper. Repeat with the remaining batter to make 8 pancakes. Keep warm by placing them in the oven at 100°C, gas mark 1⁄2, until required. Pour the honey over the rum-soaked bananas and cook gently, stirring occasionally, for 4-5 minutes, until the bananas have softened slightly and are caramelised. Serve 2 pancakes per person, folded in half, then in half again, and place the bananas and syrup on top. Dust with icing sugar and serve with 1 tablespoon of the fromage frais. Using a pastry brush or kitchen paper to lightly oil the pan, rather than pouring the oil straight in, helps to reduce the fat content of the pancakes. 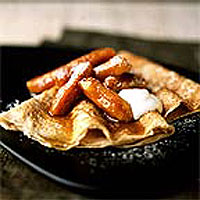 The honey-glazed bananas also make a lovely topping for low-fat yogurt. This recipe also works well with 2 x 100g packs Waitrose Dried Apple Rings or a 200g pack Waitrose Semi-Dried Large Figs, cut in half. Both are available in the fruit and vegetable section.